Chocolate and confectionary company Lindt is one of those typically under the radar blue chip stocks, with the fact it’s a Swiss company listed abroad rather than on the NYSE acting as a kind of invisibility cloak to a lot of buy-and-hold investors. It’s two-thirds the size of Hershey with comparable business economics – meaning the company operate in an exceptionally stable sector with incredible brand recognition and loyalty which leads to very high quality underlying earnings. It converts something like 10% of revenue into after-tax net profits, pays out 50% of those profits in dividends and have been able to grow those high quality earnings at a rate of nearly 10% a year. Premium chocolate is something that will probably still be a thing a few decades from now, and given a modest rate of population growth, pricing and market share gains you can be pretty confident that the company’s profits in a few decades time will be significantly higher than they are today. If you wanted to purchase just a single share of the company with attached voting rights you would have to find over 70,000 CHF to do so (that’s about $70,000 now due to the Swiss franc/dollar parity). That’s the equivalent of paying the average annual gross salary in Switzerland to own the right to vote in the company’s annual meeting along with the associated claim on their cash flows. Even if you wanted to just buy the participation certificates, which have no voting rights, then it would still set you back 6,125 CHF for each one. That is Lindt’s way of promoting a certain type of shareholder – one who isn’t going to be excessively trading the stock but who, once purchased, will hold it for years and treat it as close to a private company as possible. You can get a similar effect in stocks where a founding family or trust still owns a huge share like Brown-Forman, Hershey and Tootsie Roll Industries. The latter two have been among the most highest performers over the last fifty to sixty years in terms of returns, yet tend to fly under the radar a lot of the time. Imagine doing so for Lindt over the last decade. You buy the stock in 2005 for a price of 16,800 CHF – deciding that it is better to own one share of such a productive enterprise rather than a new kitchen which you could have got for the same price. In that time you have already been paid gobs of dividend cash – 5,290 CHF in total – and will likely do again in the years to come. Consensus estimates have the dividend at 870 CHF and 940 CHF for 2016 and 2017 respectively, a combined amount which would represent over 10% of your starting capital alone being returned to you. The problem is that Lindt now appears to be in the valuation danger zone; the point where buying the stock today comes with the significantly higher risk of poor returns over the next decade or so. Over the past twenty years the price alone has compounded at a rate of 14.80%, and that’s not including all the dividend cash that would have been paid out in that time either. Usually if you’re just looking to out your savings to work over really long-term frames, perhaps towards a retirement or for your kids/grandkids, you’re not going to be splitting hairs when it comes to value. The difference between paying something like 18x earnings for a company compared to 20x earnings will get lost if you’re talking about exceptionally long timeframes. Every now and again though you get presented with values that just can’t look past. Think Coca-Cola in the 1990’s approaching 40x earnings for example. Another one that comes to mind is Microsoft and Cisco during the height of the dot-com bubble when they were selling for crazy, sometimes triple digit multiples of their actual profits. It’s testament to the quality of these companies that eventually you not only make your money back, but also start to generate positive returns. If you reinvest dividends the process is a lot faster. Why though would you accept an earnings yield of 2.5% for holding Lindt shares, when you could get more than double that for buying a stock like Diageo or Dr Pepper Snapple Group with comparable business economics and growth rates? 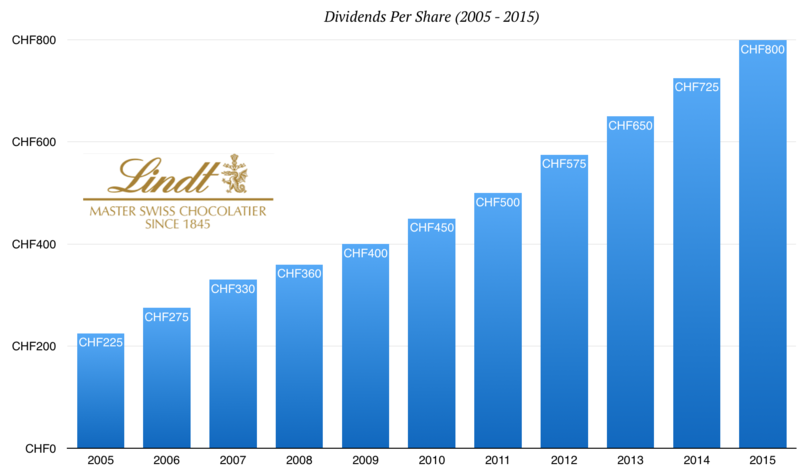 Back in 2010 you could pick up Lindt shares for 27,000 CHF, which at the time was backed up by just over 1,000 CHF in annual earnings over previous year. 27x earnings for a stock with decent growth prospects might normally be considered a bit on the rich side. For Lindt you factor in the superb underlying business and very stable operating sector and paying that kind of valuation multiple will probably leave you feeling pretty comfortable over the next few decades. As I mentioned above if you’re the type of investor happy to buy shares at 30,000 CHF each then it’s pretty likely you will be viewing that investment in terms of years rather than something to trade. Each year though the valuation multiple has continued to expand. The underlying profits have been growing at a great rate despite the enormous appreciation of the Swiss franc relative to other currencies. In 2015 the company increased sales by 13.5% in constant current terms before taking a massive 5.6% hit because of currency issues. So there’s a degree of accounting masking the “true” price of the business, yet despite those headwinds you’re still going to need massive continued growth in order to justify the share price – something in the order of 15% for the next decade in order to justify the current price. Now you have to pay over 45,000 CHF to get your hands on the same 1,000 CHF of underlying earnings. It’s a stock that anyone serious about long-term investing should look out for, even it’s just the more accessible participation shares rather than those that come with full voting rights. But it’s not a buy at this price, not compared to what else you can get (even in this historically expensive market). Keep it on the watchlist and enjoy the chocolate instead.